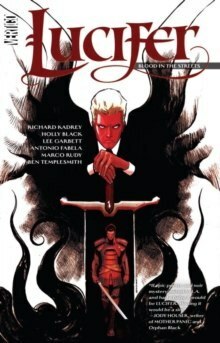 Lucifer Morningstar continues his comeback in the thirdvolume of this series by best-selling writer Holly Black (The SpiderwickChronicles) and new series writer, and New York Times best-selling author,Richard Kadrey (Sandman Slim)! After his harrowing confrontation with Godhimself, it's time for Lucifer to enjoy the season to be merry. Featuring aKrampus-approved holiday special, this third volume of the new hit LUCIFERseries takes the bringer of light through the streets of Los Angeles, the depthsof the underworld and the deepest recesses of his own mind while he tries tolive his life as a part of an ancient evil tradition and as a member of theliving world. Collects LUCIFER #13-18.